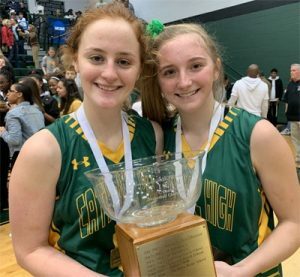 Catholic High senior Kate Walz (left) and junior Madison Liggett combined for 33 points in helping the Cubs knock off top-seeded Indian Creek in the IAAM C championship game Sunday at Stevenson University. It was a record three decades in the making and now it belongs to veteran girls basketball coach Jim Stromberg. Stromberg, who took the helm of the basketball program of The Catholic High School of Baltimore, last summer, became the first coach in the history of the Interscholastic Athletic Association of Maryland to win a championship in all three of the league’s conferences as his Cubs upset top-seeded Indian Creek, 60-56, in overtime, for the C title Sunday afternoon at Stevenson University. Previously, Stromberg led now defunct Seton Keough to the A Conference crown in the 1999-2000 season, before winning the B Conference with St. Paul’s School for Girls in 2008-2009. He also won three Catholic League regular season championships while at Keough. The primary uniform color for all three programs was green, just slightly different shades. The Cubs (13-9 overall), who suffered a 26-point loss to the Eagles (17-4) when they visited Crownsville back in mid-December, led most of the way Sunday. But the Baltimore City school had to battle from behind after losing the lead midway through the fourth quarter. The clincher was a three-point jumper from the right corner by senior Kate Walz, with six seconds left in overtime, giving the Cubs a four point victory. Walz finished with 15 points. Indian Creek’s Megan Bunker, who scored 18 points in the contest, opened overtime by making one of two free throw attempts to push the Eagles on top, 52-51. Catholic, which had struggled on the offensive end of the floor throughout the second half, suddenly re-found it’s shooting touch. 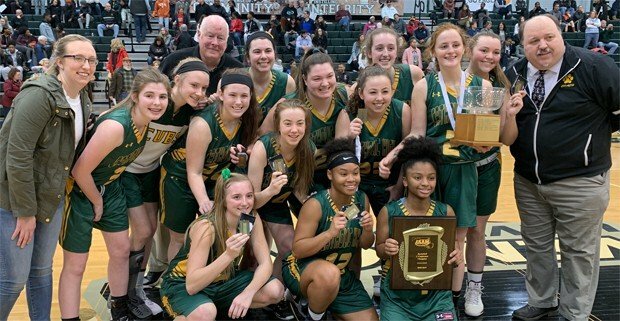 Madison Liggett, who led the Cubs with 18 points, hit a driving layup and after senior point-guard Nielah Jones converted 2-of-4 free throws, on consecutive trips to the line, Catholic led, 55-52, with 2 minutes, 4o seconds left to play. Bunker scored for Indian Creek with 1:05 to play, but freshman Sanai James countered with a score, pushing the Cubs’ lead back to three, with 40 seconds left. Indian Creek star Maddie Evans, who scored a game-high 24 points in her final high school game, was fouled as she hit a layup on the interior, but could not convert the “and one” to tie the contest with just 33.7 seconds left. Not wanting to foul in a one possession game, Indian Creek played defense as Catholic ran off most of the remaining time, but as the 30-second shot clock was winding down, Walz found some free space in the corner and she hit nothing but net. Liggett said Stromberg was a calming voice when the lead slipped away in the fourth quarter. Catholic demonstrated that this contest would be much different than the earlier meeting right from the outset. The Cubs began both the first and second quarters with 8-0 runs. In the opening quarter, Jones and Waltz each drained three-pointers on opposite sides of a basket by Liggett to give the Cubs the early lead. Evans scored six points in the opening stanza to help Indian Creek battle back within three, at 14-11, after one quarter, but a pair of three pointers by junior Meghan Brandt and a basket by Walz stretched the Cubs’ lead to 22-11, early in the second quarter. Catholic High twice led by as many as 13 points in the second quarter and settled for a 32-21 advantage at the break. 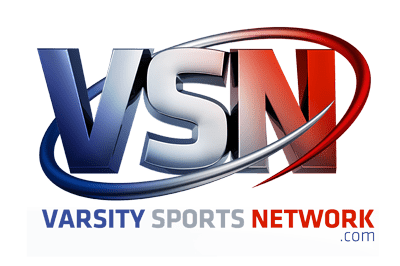 Brandt had three three-pointers in the second quarter for all nine of her points and the Cubs connected on eight shots from behind the arc, while Indian Creek had none. Evans and senior center Delaney Dignam, who scored eight points and collected 10 rebounds before fouling out late in the fourth quarter, each scored six points in the third quarter to help the Eagles outscore the Cubs, 17-8, in the period. Indian Creek scored the final six points of the quarter and went into the final period trailing by just two points, 40-38. Despite feeling the heat, Catholic was able to stay in front for more than three minutes of the final quarter, but a basket by Bunker allowed the Eagles to earn their first tie, 43-43, with 4:52 left in regulation. Walz pushed the Cubs back in front by two, but ICS pulled even again with a basket from Janeiyah Cajudoy and the Eagles finally took their first lead, 48-45, with an old fashioned three-point play from Evans. After a pair of free throws by Catholic’s Liggett and two more from Indian Creek’s Evans, the Eagles still held a three-point lead, with 55.6 seconds left. With 44.8 seconds remaining in the fourth quarter, Walz was fouled attempting a three-point shot and she calmly stepped to the line and drained all three free throws to tie the contest at 50. Jones made a steal for the Cubs and was fouled while driving to the basket with 27.8 seconds to play. She made 1-of-2 to push Catholic back in front by one. Bunker was then fouled on the other end, with 11.5 seconds left. She missed the first attempt but made the second to tie the game, 51-51. Catholic turned the ball over on its final possession of regulation, with 3.3 seconds to play, and Indian Creek was unable to get off a shot before the buzzer sounded. Indian Creek coach Ciaran Lesikar said the loss should not tarnish what his team accomplished this season. For his part, Stromberg accepted no credit for this title or any of the others on his resume. Walz did not quite agree with her coach on his role and impact on this team. 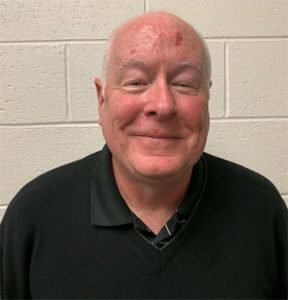 Although he deflected all credit, veteran coach Jim Stromberg was the final ingredient in building a championship basketball team at Catholic High. “Strom” has now won IAAM titles in the A, B and C Conferences. INDIAN CREEK – Janeiyah Cajudoy 2, Megan Bunker 18, Maddie Evans 24, Delaney Dignam 8, Peyton Frisby 4. TOTALS: 19 18-30 56.